Edmund is the privileged son of a king, travelling cautiously in disguise. Elspeth is the fierce daughter of a shipmaster, working proudly at her father’s helm. Their paths are thrown together when they are the only survivors of a terrible shipwreck. All they want is to return home. But they learn that an evil warlord plans to destroy their homeland, and discover that they each possess mysterious powers significant in the fight against him. And so, aided by a learned old man and accompanied by an enigmatic minstrel, the children are forced to comply with destiny. Edmund and Elspeth narrate alternate chapters, creating a read which should appeal equally to both boys and girls. A. J. Lake’s historical knowledge of the Dark Ages means that the ancient British setting is well realised; perceptive details woven subtly and consistently throughout the tale give us a satisfying feel of the texture of their daily lives. Though ‘the dragons are coming’ we don’t encounter many throughout the story (we get just a brief glimpse of the one who caused the shipwreck at the beginning of the book). The conclusion foretells more dragon action in the next book, as well a quest to defeat a malevolent god. Which means that fantasy fanatics who enjoy this story should be left eager to read the next in The Darkest Age series. Something of an egotist and concerned to the point of preoccupation with his appearance and the way others perceive him, John Blue is scathing about his brother Dane and his friend Lee, dubbed the two cheeses, Dane-ish Blue and Dairy Lee ‘ because his presence is somewhat unfortunately accompanied by a stale, milky sweat smell. Dane and Lee are huge fans of Star Wars and so, on learning about the ‘BIGGEST MEETING IN THE HISTORY OF THE GALAXY’ due to be held in New York, are keen to attend the convention. Plans are scuppered, however, as the pair do not have the money to enable this, having spent it all on Star Wars toys, costumes and other paraphernalia. John Blue is a guitarist in a fairly ineffectual band. Sibling rivalry and disdain for his brother cause him at ever-increasing intervals to make an ‘L’ shape with his finger and thumb against his forehead whilst chanting L-L-L-Loser. This becomes a line of a song that he creates a killer riff to go around! Here is a book all self-respecting teenagers could feel proud to be caught perusing, this is testament to the high production values and the quality of writing Barrington Stoke titles embrace. A short and sassy book with Catherine Forde’s ear for teenage idiom and demotic makes for a convincing read. Investigations are driven by Johnny’s tense, nervous energy, carried out against an increasingly tumultuous backdrop of gangland violence and war-fare that is instigated by Taylor himself, who presides over the estates as gangland baron. The revelations Johnny makes lead him directly to Taylor and so threaten to endanger his sphere of family and of friends. The novel concludes with a highly dramatic, classic and beautifully realised show-down on the top of the block of flats where Johnny and his mother live. The covering of snow adds depth and atmosphere to this gripping finale which is reminiscent of Joyce’s ‘The Dead’ in its frost-atrophied ending. The importance of friendship and by consequence of trust is a common thread to much of Michael Lawrence’s writing. When readers are first introduced to Oliver Pie, he is between his thirteenth and fourteenth sigh, all of them made due to the prospects of the adult-centric world that he inhabits and into which he is about to be thrust head-first once more. When Oliver opens the ram-shackle door at the bottom of his garden, he pushes aside much of the adult influence and constraints of imagination and possibility that have been exerted over his life, stepping instead into a world where there is ceaseless growth and endless openings before him. A griffin, a stone statue located amidst the long green grasses on the other side of the door, forms an anachronism but at once a manifestation of trust and of the needs-fulfilled that accompany the best friendships. It is little surprise then that after confiding in his father about the Griffin, Oliver feels betrayed when the Griffin is sold to the nearby garden centre. A terrible sense of foreboding broods in the minds of all who approach the statue in the garden centre as transference of feelings occurs. Oliver Pie who has developed emotional attachment to the Griffin shares particularly in this and so must find a way to try to alleviate some of his newfound friend’s anxiety. This is achieved through convincing the Griffin that though he might be from another age, that there is still place and purpose for him in the present. This is the first book in ‘The Clouded World’ Series. This book is being explicitly marketed at fans of the fabulous Philips (Reeve and Pullman) and it does indeed touch upon some of the themes explored in their books. As in the ‘Mortal Engines’ series, Armory presents a re-imagined, scavenged world that has diverged dramatically from our own (technology is the catalyst in Mortal Engines, while here it the branching of human evolution) resulting in a deeply divided society and an incipient ‘class’ war between its highest and lowest tiers. Armory also alludes to the abuse of religious dogma, a theme that is explored so dazzlingly in ‘His Dark Materials’. However, I think that The Fledging of Az Gabrielson does have an appeal of its own; the story taps straight into that atavistic human desire to fly and there are some intriguing, ambiguous characters (I loved Mr Mordadson) who are often beautifully named (Ramona Orifielsdaughter Enochson!). It will be interesting to see how Amory takes this story forward and whether he chooses to distance himself from the inevitable comparisons. A self-professed ‘heroic tale of daring deeds, dangerous dragons, blood, gore, smoked cheese ‘ and motherhood’, ‘Fearless Dave is the latest novel by Bob Wilson, most famous for his Stanley Bagshaw stories. Employing the form of a graphic novel, ‘Fearless Dave’ is the story of Dave, a zealous, if somewhat ineffectual knight-in-embryo and his well meaning, though somewhat overbearing, mother. Good natured, playful jibes are made about the excesses and hyperbole of history and age-old stories as a tour-guide fervently embellishes the true story of Dave, presenting instead a heroic account to amaze his audience, the contrast between this and the true pictorial and narrative account of Dave’s deeds make for a tongue-firm-in-cheek romp of a read. 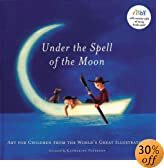 The styles and cultures of world illustration are magnificently show-cased in ‘Under the Spell of the Moon’. This impressive and highly collectable collection of illustrations from across the globe is a celebration of artists put together by The International Board on Books for Young People (IBBY) http://www.ibby.org/ who administer the prestigious Hans Christian Andersen awards. Donations of the illustrations by the artists allows royalties from the sales of the book to go to IBBY enabling it to sustain and develop it work in ensuring children the world over have access to high quality books. Each artist presents a short text ‘ nursery rhymes, poetry, riddles, idioms etc ‘ to accompany their illustration. A wealth of recommendations for artists and books to seek out makes this a most welcome addition to the multi-cultural bookshelf and a book to pore over and admire. Poems are collected under eight headings, some to make one laugh, some to make one think but all of which inspire admiration in the playful, imaginative use of language that opens up new ways to perceive the world around us. Contributors include Paul Cookson, Brian Moses, John Foster and Andrew Fusek Peters. Living in the Kalahari Desert with his large family makes Sunny long for a place of his own. So it is he packs his case, leaves a note of explanation for his family ‘ replicated in photographic form within the book ‘ and sets off to find a new home. Sunny’s travels lead him to his Uncle Bob’s, to stay with cousins Scratch and Mitch , to cousin Edward and to numerous other family members. Lift-the-flap postcards presented ‘as-written-by-Sunny’ provide additional ‘colour’ to the story giving an intimate account of Sunny’s adventures. Gravett’s observations of Meerkat behaviour is exceptional and creates a vibrant contrast with the detailed simulated facsimiles postcards from Sunny. This is a sophisticated and clever picture-book that benefits from multiple, close readings, that does not patronise its reader and that successfully widens both field and audience for the picture-book, admirable achievements worthy of celebration. 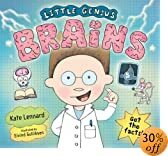 A pint-size professor, Little Genius, acts as a tour-guide on this whistle-stop tour through the anatomy, functions and health of the brain. This guided approach by a peer creates a feeling of informality and of direct involvement by children in the learning process. The brain, its substance, size, form and location in the human body are introduced. Basic technical language is used, such as ‘skull’ and ‘brain-stem’ with clear illustrations and associations ‘ the brain stem is compared with a flower stem ‘ to aid both comprehension and memorisation. Awareness of the basic control function of the brain is provided through lift-the-flap paper engineering depicting the right hand side of the body and the left half of the brain revealing the left half controls the right side of the body, turning the flap indicates the reverse. The more specific functions and tasks that different sectors of the brain are responsible for are emphasised through the use of a colour-segregated ‘brain map’ and a series of vignette illustrations depicting Little Genius in the process of carrying out various tasks against the backdrop of the colour corresponding to the respective part of the brain responsible for its handling. Brain sizes in different creatures and in different stages of human development are outlined, as too is the brain’s need for blood, oxygen, rest and stimulation. Though Little Genius might be a small protagonist, he introduces big ideas, content here is pleasingly cerebral both in matter and in method.